The Problem: Oil spills from exploration for and transportation of oil and gas, as well as from urban and agricultural run-off, pose substantial risks to marine turtles and to the habitats they rely upon. Oil from spills and leaks that sit on the surface of the water doesn't really stick to sea turtles like it would to other marine species. But oil can get in their eyes, on their skin, and in their lungs when they come to the surface to breathe. Although turtles maybe the toughest in terms of resisting some of the immediate physical damage from oil spills, they have proved to be more vulnerable to chemical exposure that happens indirectly through the food they eat. Not only do larger spills pose a problem for the turtles, studies have shown that continuous exposure over time will weaken a sea turtle's overall health, making it more susceptible to other dangers. Because sea turtles are highly migratory - spending different life-history stages in different habitats - sea turtles are vulnerable to oil spills at all life stages: eggs on the beach, post-hatchlings and juveniles in the open ocean gyres, subadults in nearshore habitats, and adults migrating between nesting and foraging grounds and on the nesting beach. A 2002 study hundreds of tiny hatchling sea turtles were captured offshore of Florida's mid-Atlantic coast nesting beaches. Turtles were captured along the "downwelling lines" that form along the western edge of the Gulfstream. The baby turtles were among the floating mats of Sargassum that accumulates in these areas. 20% of the hatchlings studied had ingested tar that had accumulated in their gut or on their mouth. Smaller amounts of plastic were also found. In an similar 1994 study 63% of the baby turtles had ingested tar. Unfortunately, areas of oil and gas exploration, transportation, and processing often overlap with important sea turtle habitats, including U.S. waters off the Florida and Texas coasts and throughout the Gulf of Mexico and the Caribbean. Areas of oil and gas exploration, transportation, and processing often overlap with important sea turtle habitats. Sea turtles have been at risk of exposure in many oil spills, particularly in the Caribbean and Gulf of Mexico. Most reports of sea turtle impacts are from Florida or the Caribbean. In addition, a spill that occurs miles from nesting beaches or feeding grounds, such as sea grass beds and reefs, can impacted these areas and sea turtles as ocean currents move the oil, generally towards the coast. Digestion/absorption of oil through food contamination or direct physical contact, leading to damage to the digestive tract and other organs. Females may refuse to nest on an oiled beach, and crossing it could cause external oiling of the skin and carapace. Eggs may be contaminated, either because there is oil in the sand high up on the beach at the nesting site, or because the adult turtles are oiled as they make their way across the oiled beach to the nesting site. Oiling of eggs may inhibit their development. Newly hatched turtles, after emerging from the nests, make their way over the beach to the water and may become oiled. If eggs are exposed to fresh oil during the last half to last quarter of the incubation period, there is a significant decrease in hatchling survival. If hatchlings do survive to emerge from the nest, they tend to have developmental deformities. Oil could prevent oxygen from getting through the sand to the eggs and could change the nest incubation temperature. Even if sea turtles avoid direct contact with oil slicks, eating contaminated food is a direct exposure path, and reduced food availability is an indirect exposure route. Oil can be trapped in the sediments of turtle grass beds, killing the seagrass, a significant component of green turtle diets. Sediments below the damaged seagrasses subsequently eroded, exposing the underlying rock bed. Decreases in invertebrates and sponge populations affect other sea turtle species as well, including hawksbills, loggerheads, and ridleys. After long-term contact with oil many invertebrates are killed and many others may decline in numbers. A variety of petroleum compounds are toxic to fish and invertebrates, although the effect is not uniform; different species have different sensitivities to different compounds. Reducing oil consumption by carpooling, using public transportation or driving energy-efficient vehicles. Support renewable energy initiatives and the creation of jobs in energy conservation and renewables in order to end Florida's dependence on oil. Get informed about local waste disposal to ensure that untreated waste water isn't introduced to natural waterways and oceans. Case Study: Between 1992 and 2001 there were 26 oil spill incidents in the Gulf of Mexico and 9 incidents along Florida's Atlantic coast. Incidents were from vessels, pipelines, platforms, and docks. One of the greatest impacts from oil has proven to be consumption. A study of loggerhead turtles found that they will indiscriminately eat anything that appears to be the appropriate food size, including tar balls. The effects on the digestive system were large esophageal swelling that displaces the liver and intestines, causing severe swelling and buoyancy problems. The study also examined the effect of oil on all stages of life. Additional information specifically on the issue of Oil Drilling off the coast of Florida, including coatal governemtn resolutions opposing drilling, media stories and newspaper editorials, can be found at www.Floridasbeaches.com. 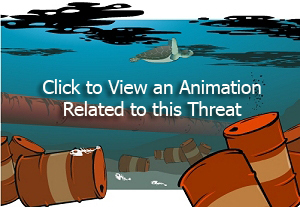 USFWS Information related to the Gulf of Mexico MC252 Oil Spill - 2010.